For vehicles, besides the fact that they need to park inside the garage, they also come with a lot of accessories which are stored in the garage as well. Most people don’t need to allow much space in the garage for storage of automotive accessories. We find that a space measuring 4 x 4 is usually enough room to store the things you need, including wiper fluid, materials to wash and wax your car, jumper cables and more. Larger items such as spare tires need a space of their own depending on where other items are stored and the space available for storage. Tires, with or without rims, can easily be accommodated on wall tire racks. Tires without rims are lighter though, and we try to put them in overhead storage along with seasonal mats and other out of season belongings. The most cost-effective way of storing car accessories is using slatwall with shelves, baskets and hooks. Alternatively, these supplies could be stored in a wall cabinet with adjustable shelves, but you’ll want a hook for cables, otherwise they get tangled and in the way. Products for washing your car such as shams, soap and buckets go on a shelf of their own. For someone who wants to work on a car in their garage, we often create a work space. 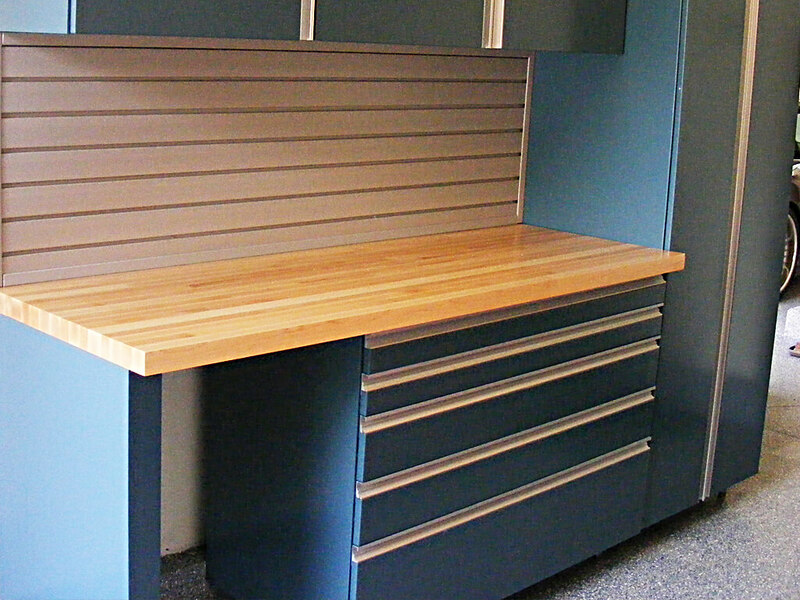 Depending on budget and space constraints, this may vary from a simple workbench made from wood to custom steel cabinets with a solid wood or stainless steel surface. A portable workbench with lockable castors is also available. The castors make it so you can roll your work area to where you need and then lock it in place once again so they become steady and safe to use. A custom cabinet or shelving system works for storing messy liquids like oil, preventing spills. It’s also a secure way to store tools and keep bulbs, gaskets and belts organized so they are easy to find. A section for storing automotive accessories is only one of many areas that we create in a garage when designing the total space.